Laser devices sent to Europe are subject to specific safety requirements. Some of these requirements are applicable even if the rest of the device is seemingly innocuous. To start with, we will present a case where a device appears to be completely harmless and therefore out of the scope of any applicable safety legislation. We often see small pen-sized laser-pointers that are powered by off-the-shelf batteries. Since these batteries are below the scope threshhold (75 VDC to 1,500 VDC) of the Low Voltage Directive 2014/35/EU it appears that the manufacturer would not need to submit the laser pointer to a lab for safety testing. This standard is challenging to comply with, namely because so few labs in the United States provide support for compliance to EN 60825-1 or the IEC version: IEC 60825-1. 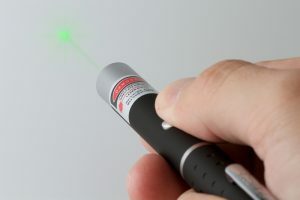 Keep in mind that if your laser pointer had a way to connect to AC mains power (say, for instance to an AC/DC adapter) then it would be considered as an AC-powered product, likely over the AC power threshhold of 50 VAC for inclusion in the scope of the LVD, and therefore you would have to comply with EN 60825-1 in order to place a CE marking on the laser. But, what about a low-power, battery-powered, laser pointer? What do you do about that in order to properly ensure its safe use? Europe has another safety Directive, besides the Low Voltage Directive 2014/35/EU. It is the General Product Safety Directive 2001/95/EC, also called the GPSD. 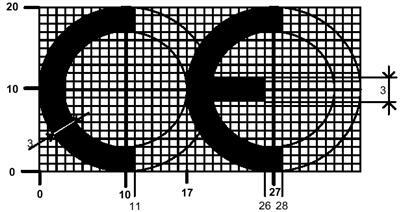 Unlike the LVD, the GPSD is not a CE marking Directive. This means that the CE marking for the product will not refer to the GPSD and the declaration of conformity will not contain any reference to the GPSD either. However, just like a CE marking Directive, in order to claim conformity, usually the fastest route is via the presumption of conformity by complying with harmonized EN standards. In this case, the GPSD and a laser device, there is no harmonized EN standard for laser product safety compliance indicated in the official list published in the Official Journal of the EU. However the EU published Commission Decision 2014/59/EU in 2014 regarding laser products and the GPSD. The most recent reference to consumer laser protection available after a web search is the same notification published in May 2016, here. See below the reference to laser products and the GPSD. The number in the last column, December 31, 2017, refers to the date the deliverable is due. It appears there will be a specific safety standard for consumer lasers, soon. This means that laser products out of the scope of another safety Directive (like the LVD) will need to comply with a specific laser safety standard in order to be compliant with the GPSD. 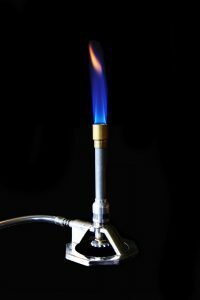 UL 94 is a standard that measures, in a laboratory setting, the burn characteristics of plastic materials. The title of the standard itself is pretty descriptive: UL Standard for Safety for Tests for Flammability of Plastic Materials for Parts in Devices and Appliances. This standard is for testing plastic materials to ensure they meet the required resistance to burning for a specific application: typically for enclosures made out of plastic. Using this standard in a laboratory setting we are able to see and record the burning characteristics of a plastic to ensure it is suitable for its intended use. The tests tell us how quickly they self-extinguish because the amount of time that the plastic stays on fire is recorded and that is part of the criteria to determine the UL 94 rating applied to the material following the testing. F2 Labs hold ISO accreditation for all of UL 94 but by far the test we conduct the most is the 50W (20 mm) Vertical Burning Test (VB Test). We will discuss this testing in this article. The VB Test is outlined in clause 8 of Ul 94 and instructions regarding the specifications of the test samples are detailed. Clause 8.3.1 identifies that the test samples, “…are to be cut from sheet material, or are to be cast or injection, compression, transfer molded to the necessary form.” Test samples need to be deburred and the edges smooth. The VB Test samples must be 125 mm (plus or minus 5 mm) long by 13.0 mm (plus or minus 5 mm) wide. The sample can be no thinner than 0.025 mm – unless they distort while in the clamp during the test set-up. In that case the sample must be thicker. 13 mm is the maximum thickness. Additionally, intermediate thicknesses in 3.2 mm increments are also required in cases where the test results are inconsistent. Pigmentation in plastic means that different materials or chemicals have been added to the plastic to change the color. This may mean that the burn characteristics are different. Therefore, each color of plastic used in your product, for which you want to claim a UL 94 rating, must be tested fully, according to the standard. For the Vertical Burning Test, you will be required to submit twenty samples for testing. Ten of those samples will be placed in an environmental chamber for seven days prior to the testing and ten will be placed in a different chamber two days prior to the testing. The VB Test then requires the burning of ten of the samples at a specific distance over a ball of cotton. The amount of time that the plastic remains on fire after the flame is removed from the plastic is measured. Whether the dripping particles are in flames and catch the cotton beneath on fire is also recorded. This data is then compared against Table 8.1 in UL 94, see below. The classification of your material is made based upon these measurements. Why 20 samples if we only burn ten? Good question. The standard requires 20 samples so that there are two batches of ten each. This is done in case there are wild differences in burning rates with the first batch of ten samples. If that happens there is a second batch with which to conduct testing. Many times you can alleviate the need for UL 94 testing for the plastic in your product by specifying suitably approved plastic from your plastic vendor. To understand what you will need (which VB rating) you will need to evaluate the design of your product against the relevant safety standard applicable to your product. The Machinery Directive 2006/42/EC, broadly, is applicable to machinery, defined in Article 2 (a) as an assembly fitted or intended to be fitted with a drive assembly to perform a function. The power, unless used for lifting purposes, must come from other than human power (electrical, hydraulic, pneumatic, etc.). ‘Lifting accessories’ which, among some other products (which will be the subject of later articles), are not ‘machinery’ as defined in Article 2 (a) and can be as simple as a C-hook or a purpose-built piece of metal used to prop open and hold a cowling on an aircraft during maintenance. Lifting accessories that are permanently attached to lifting machinery are not considered as lifting accessories, the definition is meant to encompass the device between the lifting machinery and the load itself. 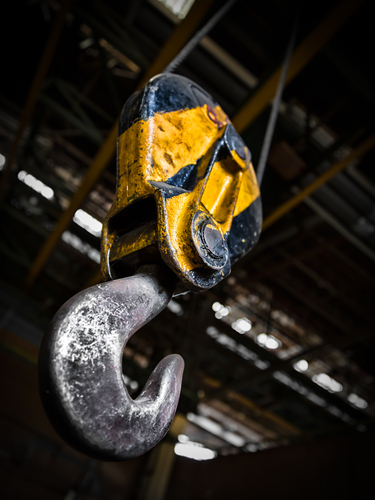 Another example is an engineered hook used to attach to something to lift it up: such as an engine or an engine part. An engineered piece of metal used in this way, though with no moving parts or electrical components, would require a full evaluation against the requirements of the Machinery Directive 2006/42/EC, Annex I, plus a CE marking, declaration of conformity, and a Technical File. The EU Commission has published some information for your review if you are unsure regarding where your equipment fits, as pertains to Article 2 (d). See some helpful links below. The change is Commission Delegated Directive (EU) 2015/863 published in the Official Journal of the European Union on March 31, 2015. The Directive is very short, only three pages, and below are three notable sections. Annex II – some of the substance restrictions indicated in 2015/863 are current substance restrictions applicable to toys per the REACH Regulation 1907/2006. F2 Labs is constantly working to help customers better understand their responsibilities in complying with CE marking Directives that may or may not apply to their equipment. Previously we published an article about the relationship between the Low Voltage Directive 2014/35/EU and the Machinery Directive 2006/42/EC. 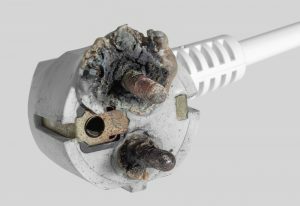 Besides the LVD’s relationship with the MD, a question that comes up over and over is the need to comply with the Low Voltage Directive 2014/35/EU for some products that are seemingly not in the scope of this law at all. 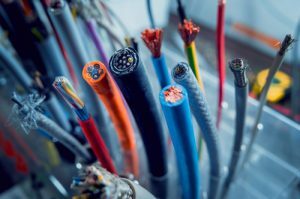 This means that electrical equipment with an input power of from 50 to 1,000 volts AC and from 75 to 1,500 volts DC are within the scope of the law. Battery powered devices that operate with an input power of 12 volts DC are therefore excluded from the law. Unfortunately, it is not that simple. For example, if you have a product that operates on 12 volts DC power but you supply an AC/DC adapter with your product when you ship to the EU then your product is operating with an input power of 230 volts AC and it is within the scope of the Low Voltage Directive. Similarly, if you do not supply the power supply with the product but you specify that an AC/DC power supply must be used with your product then it is considered an AC powered product and therefore will operate at 230 volts AC power and is within the scope of the LVD. 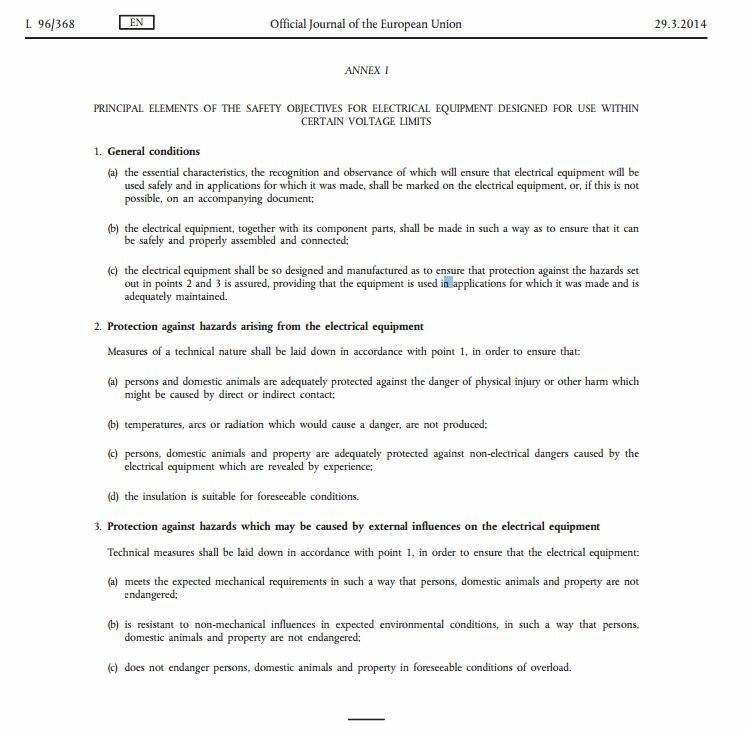 Also note that both the Radio and Telecommunications Terminal Equipment Directive 1999/5/EC and the Radio Equipment Directive 2014/53/EU require compliance with Annex I of the LVD no matter the voltage. Note that Directive 73/23/EEC was the Low Voltage Directive in effect when 1999/5/EC was written. By law that refers to, now, the Low Voltage Directive 2014/35/EU. It is informative at this point to also point out that both the R&TTE 1999/5/EC and the RED 2014/53/EU exclude the Low Voltage Directive from being applicable to the equipment if either R&TTE or RED are applicable. (7) The objectives with respect to safety requirements laid down in Directive 2014/35/EU are sufficient to cover radio equipment, and should therefore be the reference and made applicable by virtue of this Directive. In order to avoid unnecessary duplications of provisions other than those concerning such requirements, Directive 2014/35/EU should not apply to radio equipment. Annex I from the Low Voltage Directive is applicable to equipment within the scope of either “radio” Directives regardless of the power input. Therefore if your device has a tiny coin cell battery and a wireless module and no connection to AC mains power you must comply with Annex I of the LVD. In these cases only Annex I from the LVD is applicable and nothing else from the LVD. The LVD will not be referenced on the EU declaration of conformity for the product because compliance with Annex I of the LVD is presumed when compliance to either R&TTE or RED are claimed. Therefore the LVD itself is excluded, only Annex I is applicable and that is through Article 3 (1.) (a) of both the R&TTE Directive 1999/5/EC and the RED 2014/53/EU. Compliance with Annex I of the LVD will require, in most cases, testing using an applicable harmonized EN standard from the official list published in the Official Journal of the European Union. The latest available list was published on July 8, 2016 and is published here: LVD standards OJ List. The option for the appointing of an Authorized Representative is made available in all of the above indicated CE marking Directives, but it is not the same for each, and whether or not it is required can also be dependent upon the compliance path of the product. We will investigate and summarize these requirements for the above EU laws in the following article. That is pretty broad. Essentially, it means that an Authorized Representative can be assigned all or some of the duties, as applicable. For the Machinery Directive, you could appoint someone to handle the whole compliance process, just a small part of it, or anything in between. An important note is that there must be a written mandate (legal agreement) between the parties. Note that the definition in the LVD is not as broad. The definition includes ‘specified tasks’ and not ‘all or part’ as in the MD. Next we move to Article 7 of the LVD which addresses specifically the role of the Authorized Representative as it pertains to the Low Voltage Directive. It is worth noting that Article 3 and Annex I are the requirements for the manufacturer in the LVD to make the product safe for use, i.e., the testing and evaluation. Additionally, the technical file is referenced in Article 7 and explicitly states that the Authorized Representative cannot be responsible for compiling that, but can be the holder of the Technical File. This layer of separation between the compliance responsibilities (that may be assigned) as an LVD Authorized Representative is in contrast to the myriad of duties assignable as an MD Authorized Representative. To highlight this, attention should now be drawn to the minimum duties for an LVD Authorized Representative. For that see (above) Article 7 (2.) – (a), (b), & (c). The Electromagnetic Compatibility Directive (EMCD) 2014/30/EU also allows the use of an Authorized Representative and since the EMCD, like the LVD, is a New Legislative Framework Directive the definition and duties of an Authorized Representative are the same. The New Legislative Framework of 2008, or “NLF” as it is referred, is the collection of a number of Directives that were written in order to streamline the responsibilities that overlap among the various Directives it encompasses. The responsibilities of an Authorized Representative under the LVD and EMCD (and others) are an example of this. Article 7 in the LVD is repeated perfectly as Article 7 in the EMCD. The EMCD, unlike the LVD, does have mechanisms for the involvement of a Notified Body in the additional conformity modules besides Module A, Internal Production Control. The other conformity modules are indicated in Annex III, Part A, Module B, EU-type examination and Module C: conformity to type based on internal production control. These two additional conformity modules, unavailable in the LVD, allow for the interface of the appointed Authorized Representative with a Notified Body who may be involved in the EMCD compliance process by lodging the application with the Notified Body on behalf of the manufacturer. 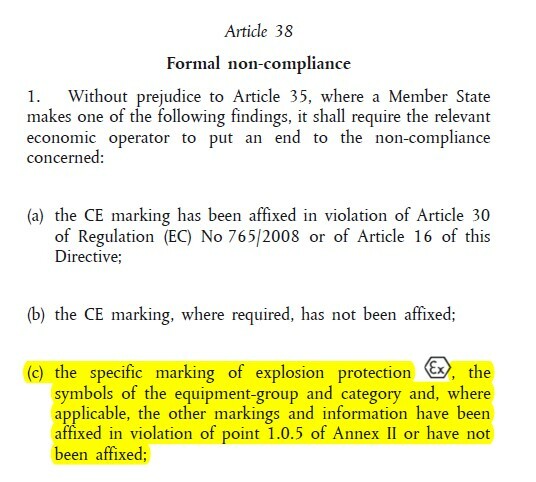 The Equipment and Protective Systems intended for use in Potentially Explosives Atmosphere Directive (ATEX) 2014/34/EU follows the same path as the EMCD previously referred to. Regarding ATEX, the European commission has published a complimentary document, the purpose of which is to elaborate, in plain English, the intent of the requirements listed in the ATEX Directive 2014/34/EU. The link for this document is here (it is a direct download link) and it is a free download, like all of the European Commission documents pertaining to CE marking. The document is titled ATEX 2014/34 EU Guidelines and section 3.5, below, elaborates on the role of the Authorized Representative. Note that there is another paragraph to section 3.5 which is not pasted above. 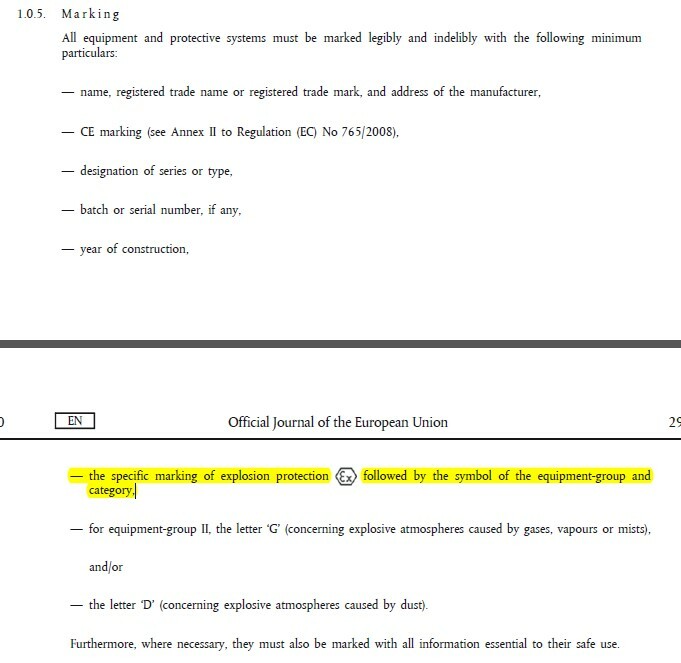 That paragraph deals with the role of the Authorized Representative responsibilities for equipment already in the EU and having used the expired ATEX Directive 94/9/EC instead of 2014/34/EU. This will not be discussed in this article. 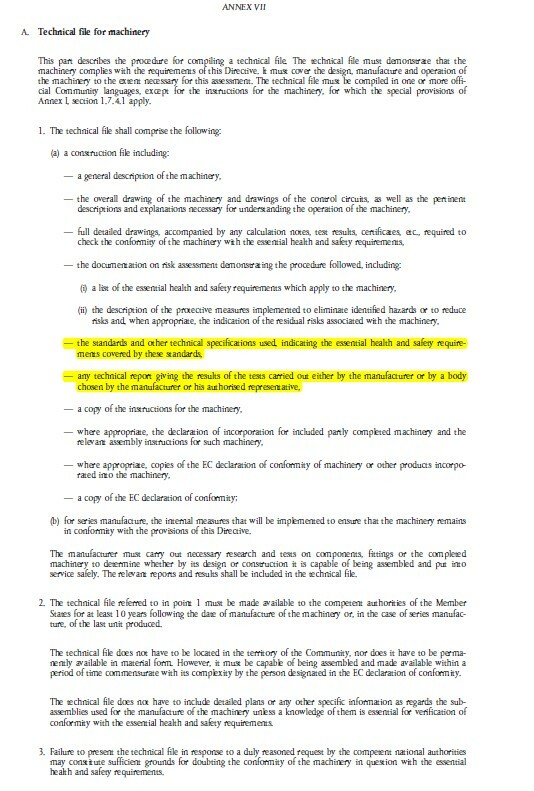 The Radio Equipment Directive (RED) 2014/53/EU follows the same path as the EMCD ATEX Directive previously referred to. The Medical Devices Directive (MDD) 93/42/EEC has perhaps the most requirements and responsibilities as compared to the other Directives referenced in this article. A manufacturer of medical devices, with the intention of making their products available in the EU, should also read and understand the very comprehensive overhaul of the MDD with the amendment to the MDD in Directive 2007/47/EU. The MDD makes requirements for the involvement of an Authorized Representative and the amendment elaborates on these roles and adds more. See below for further explanation. 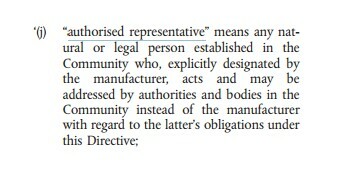 There are twenty mentions of the term “authorised representative” in Directive 2007/47/EC. This article will focus on the most important aspects of the amended requirements. First, we note that the installation of a required Authorized Representative for manufacturers without a physical EU footprint is now codified in the MDD by the addition of recital (14), below. The definition of Authorized Representative, as pertains to the MDD, is added to Article 1 (2.) 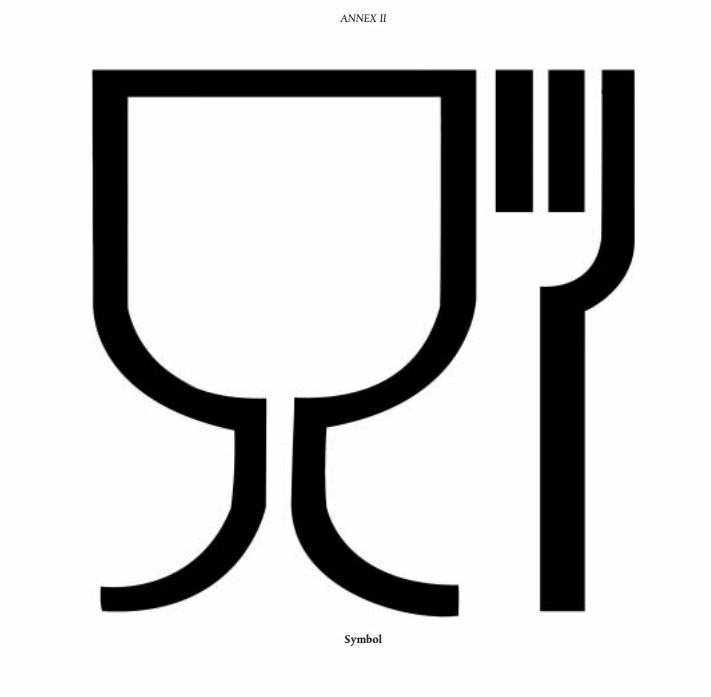 (j). Article 10 (a) (2.) mandates the requirement for an Authorized Representative, physically located in the EU when the manufacturer does not have an office or location in the EU. …is replaced by this section from the new Directive 2007/47/EC. To sum this article up, please see the below bulleted points. The MD does not require an Authorized Representative but you may appoint one to handle some of the duties, some of which may be difficult to satisfy. For instance, the requirement for a European address on the declaration of conformity. The LVD, EMCD, ATEX, and RED do not require an Authorized Representative but if you assign one there is a minimum list of required duties that must be ascribed. The MDD requires an Authorized Representative if you are putting your products in the EU but do not have a physical location in the EU. All Authorized Representatives, for assistance in meeting compliance requirements for any of the aforementioned CE marking Directives, will require a written mandate or agreement in place that designates duties and responsibilities. 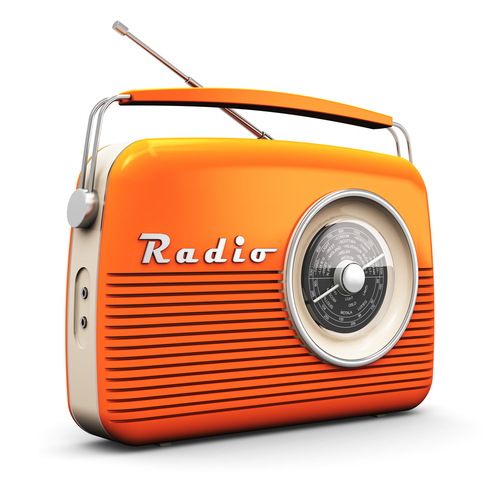 The Radio Equipment Directive 2014/53/EU, or RED, came into force in June of this year. 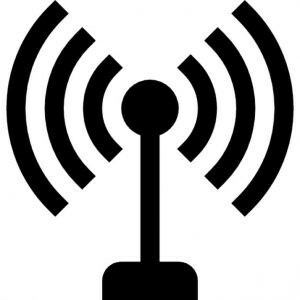 This new Directive replaced the Radio and Telecommunications Terminal Equipment Directive 1999/5/EC for wireless equipment, also called the R&TTE Directive. There is a one-year transition period for the RED so until June 2017 you can choose an appropriate compliance path, or compliance module, from either Directive. There are a few changes with the new Directive that will be discussed in this article. First, let’s define the type of equipment that is within the scope of both Directives. The scope and definitions of the R&TTE Directive 1999/5/EC is below. This Directive establishes a regulatory framework for the making available on the market and putting into service in the Union of radio equipment. From the outset, as demonstrated above, we can see that the R&TTE Directive covers radio equipment and telecommunications terminal equipment (read that as “wired”) while the RED us for radio equipment, only. There are three other ‘major differences’, please read on. The second big difference between the R&TTE is the lowering of the frequency limit. The R&TTE applied to radio equipment from 9 kHz to 3,000 GHz (see 1999/95/EC, Article 2 (d)) while the RED applies to radio equipment operating below 3,000 GHz (see 2014/53/EU, Article 2 (1. (3)). Thirdly, the R&TTE Directive allowed the manufacturer to choose to comply with either the R&TTE Directive or the Low Voltage Directive and the EMC Directive, as long as the radio module used in the device was suitably approved to the R&TTE Directive (see Article 10 (2.)). What this means is that if your product incorporated a wireless module that was already tested, evaluated, found to be compliant, and had a CE marking with a claim to the R&TTE Directive then you could follow the conformity modules available in the Low Voltage Directive and the EMC Directive instead of the R&TTE Directive for the overall apparatus. This option is not available in the RED. Finally, the RED has a new requirement for the registration of products that fall into a product type that is commonly non-compliant. See Article 5 below. There are other changes and some differences not addressed in this article. Many are the same changes in the other NLF Directives. 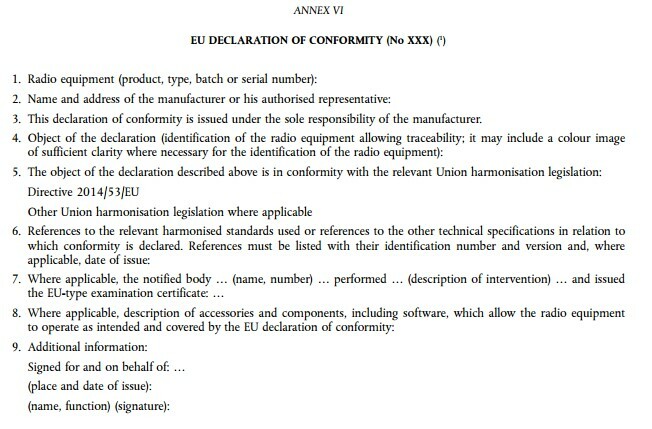 Another is the introduction of the simplified EU declaration of conformity. 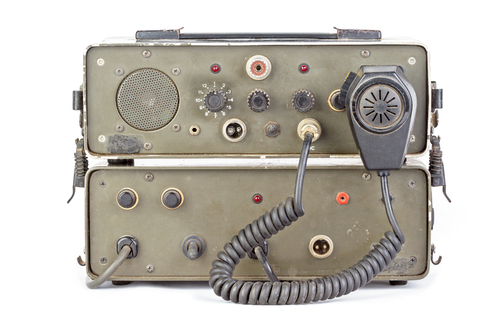 We will publish more articles regarding the new Radio Equipment Directive 2014/53/EU in the future and will discuss more changes brought in with the Radio Equipment Directive 2014/53/EU and others. Before I close this article I want to discuss one more issue regarding the RED. That issue is the use of harmonized EN standards for the proof of compliance to the Directive. For now (as of September 15, 2016) there are only eight official, harmonized EN standards for proving compliance to the RED. By ‘official’ I mean they were published in the Official Journal of the European Union. That list is here: RED harmonized EN standards. There are a number of harmonized EN standards that are applicable to the R&TTE Directive. The official list is here: R&TTE harmonized EN standards. We suggest you bookmark that link because the list has been removed and from the official European Commission page for radio equipment. The R&TTE Directive is three months into its 12-month final tour and so the EU has removed reference to the R&TTE standards and replaced it with the list of eight RED standards. This is important because between now (September 2016) and the end (June 2017) the guidance we have received from the EU RED Notified Body we partner with for EU-type examinations (the formal review process for technical documentation and reports that is required for some radio products) is that you are able to use either the R&TTE standards or the RED standards to prove compliance to the RED. It is expected that the official RED list will be populated with most or all of the R&TTE standards by next June anyway. Manufacturers who build equipment for sale to customers in the European Union may spend a lot of time learning about and understanding the process that is required in order to sell their products with a CE marking on it. Placing a CE marking on your equipment is your claim to the European Union that your product complies with any applicable CE marking Directive. This is an important point because there are many CE marking Directives and any that are applicable (meaning: your product is covered under their scope(s)) must be addressed and complied with. Neglecting to comply with a CE marking Directive because you did not know it is applicable to your product does not reduce or negate your obligations. The General Product Safety Directive 2001/95/EC has no mark and compliance to it is not indicated by CE marking. It is implied simply by placing your product on the market in any of the EU member nations. The Ex mark is interesting because it is a mark that is required in addition to the CE marking. We do not see that in other CE marking Directives. 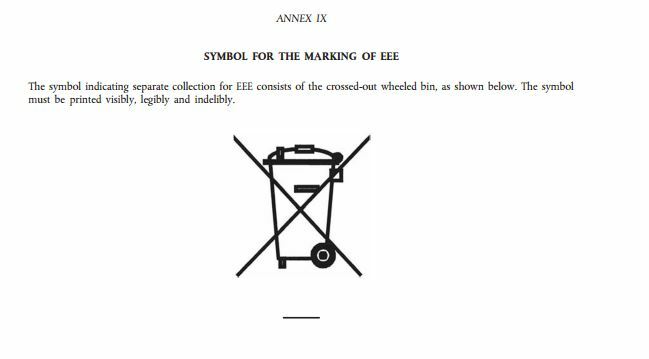 The Ex mark is mentioned throughout the ATEX Directive 2014/34/EU. The Restriction of Hazardous Substances (RoHS) Directive 2011/65/EU is a CE marking Directive. This means that only the CE marking is recognized as showing that the product is in compliance with the RoHS Directive. Furthermore, if your product is within the scope of the RoHS Directive and you place a CE marking on it then that means that you are claiming that your product complies with the RoHS Directive 2011/65/EU – even if you did not even know that your product is within its scope. None of those RoHS markings mean anything legally. 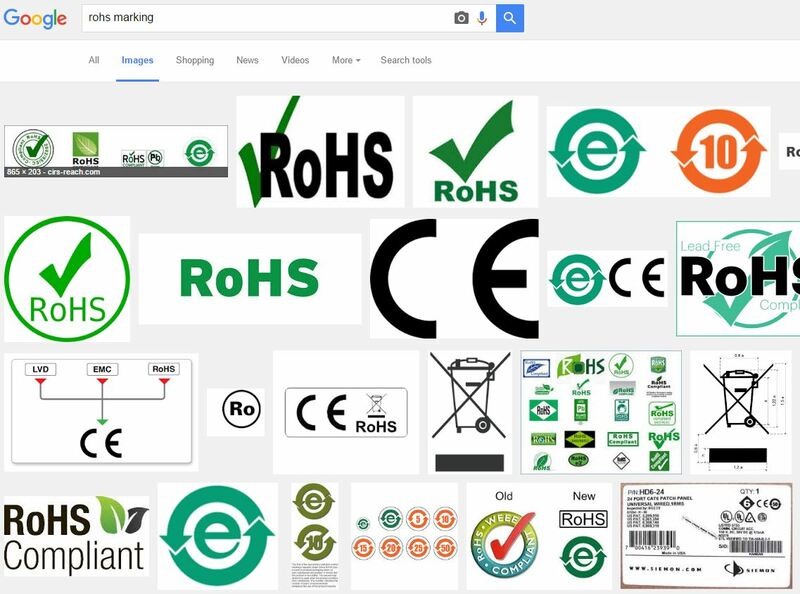 The EU RoHS markings are the result of marketing, drawn up by an artist and put on a product to convey RoHS compliance but they are not legal marks. Some of the other markings convey Chinese RoHS compliance, which is not related to EU RoHS compliance in any way. The staff at F2 Labs can help you sort out these requirements, the markings you will need, and how to perform the necessary testing and evaluation required prior to the application of the correct markings. Silently and slowly – but inexorably… the Directives and standards we use for CE marking are updated, revised, and replaced – and we must account for them. They must be correct when referenced on your declarations of conformity and that means that you have to check, once in a while, to make sure that the product you are sending to the EU was tested and evaluated using the current, relevant EN standards and claim compliance to the current Directive(s). F2 Labs suggests that you check the status of your CE marking Directives and EN standards at least once per quarter if you are actively shipping products to the EU. We will show you how in this article. There are two parts to the compliance of your product when you get it ready for the CE marking. The first is to determine which CE marking Directive(s) is (are) applicable. You must comply with whatever laws (CE marking Directives) apply to your product. The second part is to determine which standards you will use to prove that your product complies with the law(s). In other words: you comply with the Directives using the EN standards. This means that you really need to check two things regarding the compliance of your product, from time to time, if you sell to the EU in an ongoing basis. The status of the CE marking Directives. These are the laws. They change from time to time. The status of EN standards. These are the technical requirements and testing used to prove compliance to the CE marking Directives. They also change periodically. Fortunately, the EU puts this information at your fingertips on the world wide web. In this article we are going to work towards checking the status of EN ISO 13849-1, which was recently updated and replaced by a newer version of itself and we will detail how this will impact your project. 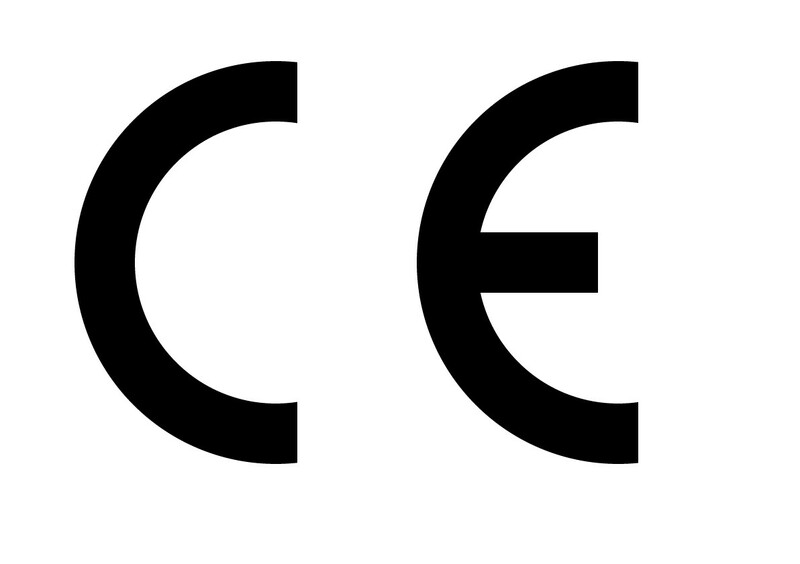 The European Commission has a page for all of the CE marking Directives. The page for the Machinery Directive 2006/42/EC is at this link. 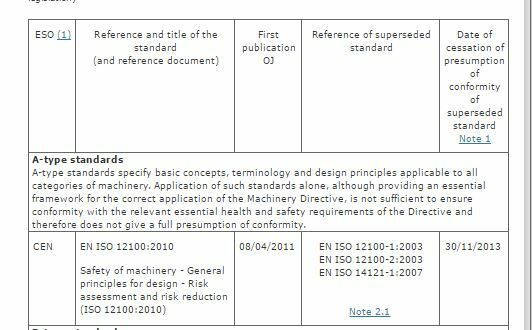 Looking at this page we first see the chart in the middle of the page which gives us some basic information about the Machinery Directive and some useful links. Scrolling down the page, we then get to the list of harmonized standards. Before we look at this list let’s discuss the role of harmonized standards and your project…. Answer: Harmonized standards are the standards that have special status in that they confer, “presumption of conformity,” to products to which they are applied when used to prove that a product complies with a CE marking Directive to which they are harmonized (meaning, officially connected or attached). …In other words, before you place a CE marking on your product it must be in compliance with any applicable CE marking Directives and in order to do so you need to show that you have selected appropriate harmonized EN standards and tested/ evaluated your product according to those standards. Yes, the standards are voluntary, but they usually provide the quickest route to compliance. Any deviation from the application of a harmonized standard during the compliance process for machinery will require a full risk assessment for each Annex I Essential Health and Safety Requirement not covered by the applicable standard. The standards route is the way to go if possible. 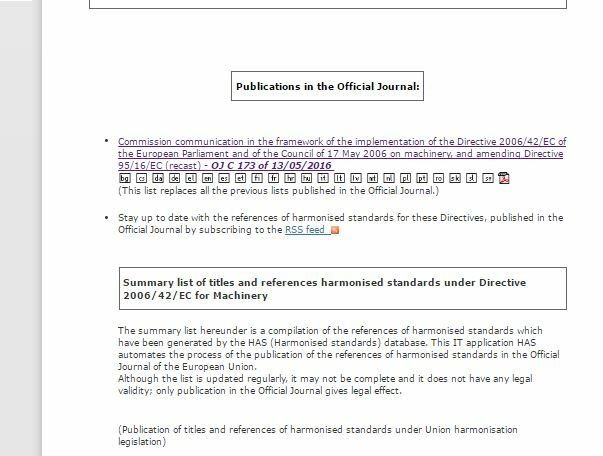 Continuing, let’s take a look at the next part of the European Commission’s Machinery Directive page, the display of the harmonized EN standards. 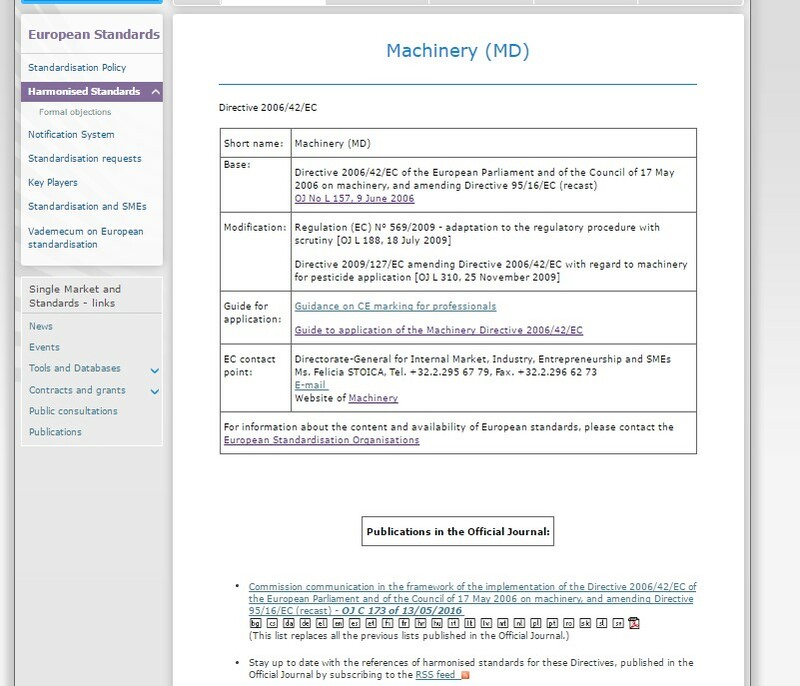 The link at the top of that screen-grab is to the official list of harmonized EN standards for the Machinery Directive. The list that follows (not in the above view) is taken from the linked list but only the list at that link is the ‘official’ list. I want to note that because sometimes, rarely, the list on the European Commission page we are discussing in this article is not identical to the official list. In order to get on the official list, and then published to the European Commission’s Machinery Directive page, it must first be published in the Official Journal of the European Union. Below is the start of the list on the European Commission page. This is the page we at F2 Labs refer to for direction when selecting harmonized EN standards for consideration by our customers for their EU projects. Let’s take a very close look at this chart so we can understand the information that it is giving to us. First, notice the reference to ESO. This is for the European Standards Organization responsible for making the standard a ‘harmonized’ standard. Frequently these standards are taken from the IEC or ISO. Usually the standards are the same as the IEC or ISO versions – but many times they are not. This is why you must reference to the EN version of the standard. EN 60204-1 is not the same as IEC 60204-1, for the purposes of CE marking. The EU has committees of engineers who decide on the standards and these groups are CEN and CENELEC. Moving right across the chart we see the reference to the particular standard. There are many, many standards on this list and the task for you or, better yet, your accredited 3rd party testing organization (for instance, F2 Labs) is to select the standards from this list that are applicable to your product and help to prove that the product complies with the Essential Health and Safety Requirements from Annex I of the Machinery Directive. Next we see the reference to the first publication date and then the superseded standard, and finally the date of cessation of presumption of conformity for the superseded standard. These dates cause a lot of confusion, all the time. Looking at EN ISO 12100:2010 we see that it was first published on April 8, 2011 (note: in the EU the month is listed second when looking at a date in the format dd/mm/yyyy). April 4, 2011 was the date that this standard was officially unveiled to the world as an acceptable standard to use for risk assessment for products falling within the scope of the Machinery Directive. Then we see three other standards: EN ISO 12100-1:2003, EN ISO 12100-2:2003, and EN ISO 14121-1:2007. Looking to the right of those standards we see a date of November 30, 2013. That date, November 30, 2013, is the date at which a product could no longer claim compliance using those three standards. From that date forward only EN ISO 12100-1:2010 could be used as the risk assessment standard. So, from April 4, 2011 until November 30, 2013 you could use either EN ISO 12100-1:2010 or EN ISO 12100-1:2003, EN ISO 12100-2:2003, and EN ISO 14121-1:2007 for the risk assessment for your machine. Starting on November 30, 2013 only EN ISO 12100-1:2010 was acceptable. EN ISO 13849-1 is a standard for control systems on machines – it is applicable to most types of machinery. Notice that it is also an ISO standard, ISO 13849-1. Note that for European projects you must reference the European version, EN ISO 13849-1. Looking at the above graphic we see that there is a new version of the standard: EN ISO 13849-1:2015. Moving right, we can see that it replaced EN ISO 13849-1:2008, and the date of cessation of presumption of conformity for EN ISO 13849-1:2008 was on June 30, 2016. Understanding what was written previously in this article we know that means that European machinery designed and evaluated using EN ISO 13849-1, could use EN ISO 13849-1:2008 until June 30, 2016. Starting on that date you must show that your machines complied with EN ISO 13849-1:2015. Therefore, on your declarations of conformity you must reference the 2015 version of the standard, if you used it, for shipments on or after June 30, 2016. Just as important, you must be able to prove that you used that standard. It is not enough to list the correct standards. Behind the declaration of conformity, you should have a compiled Technical File to be able to prove to the European Authorities that your product actually complies with the current, relevant standards. Otherwise your product does not comply with the Directive. The Technical File is your proof that the machine was actually compliant with the applicable CE marking Directives at the time you sent it to the EU. Further, you must be able to compile it and send it to the authorities, upon request, for ten years after you ship. Following is Annex VII from the Machinery Directive 2006/42/EC which is the Annex for the Technical File. Note in particular the highlighted sections. Without application and compliance with the relevant, current, harmonized EN standards your machine is not in compliance with the Directive – and that means that technically you are breaking the law. How can this impact me? Good question. Let’s take a look at a hypothetical situation that can show the ramifications for taking short cuts. Widget Machine Company builds an industrial press and sells it to a company in France. The French company uses it for seven years and then decides to upgrade its machine. In order to fund the purchase of the new machine they sell the Widget Machine Company industrial press and use an auction company to do it. The auctioneer sells it to a Romanian company and the machine is shipped to Romania from France. No translations are performed on any of the manuals from French to Romanian and after a few weeks a worker decides to service the machine for some issue. He removes a guard and cannot figure out how to reattach it. The next shift starts, the guard is on the floor next to the machine, and a new worker crushes part of his hand. The authorities will be involved and will make contact with Widget Machine Company to make a request for the Technical File. This will come by court order. It is at this point you will either be glad you followed the correct procedure, used the right standards, and put your Technical File together at the time you built the machine and kept it updated or you will be looking for a lawyer to represent you in a European court. A quick search of the Official Journal of the European Union yields many examples of court cases involving companies that did not follow the correct procedure or were unable to prove that they did. 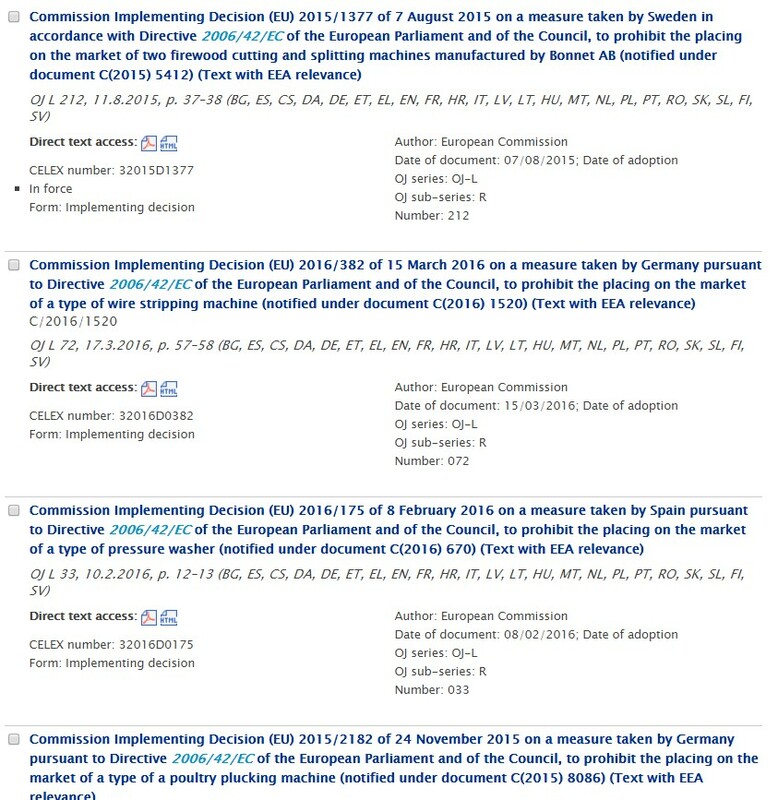 Looking at the first case in that list (there are many, many more), we see it is titled Commission Implementing Decision (EU) 2015/1377. Opening that document and reviewing it tells us that a company in Sweden manufactured and sold log splitting equipment. It somehow came to the attention of the authorities and now the company is barred from placing a CE marking on the equipment… and barred from the entire EU. Making sure that your equipment is appropriately compliant with the current Directives by using currently applicable harmonized EN standards will prevent this. I first read the new Radio Equipment Directive 2014/53/EU (aka the “RED”) in 2014 when it was published and noted its similarity to the other NLF Framework Directives as it pertains to the documentation compliance process and the conformity modules. Really, that is the point of the NLF: to make it easier for manufacturers to sell in Europe. The RED replaces the R&TTE Directive for equipment with radio communication ability and the new Directive offers an easier way to show compliance as pertains to the declaration of conformity. In the other technical Directives we work with on a daily basis, there was no major change to the format or structure of the document. The RED is different because of the introduction of the simplified EU declaration of conformity. A ‘simplified’ EU declaration of conformity? What is that? To answer that question, let’s use the opportunity to briefly explain the concept of the declaration of conformity and what it is. A declaration of conformity is what sets the CE marking Directive apart from all other Directives, Regulations, and Decisions we see when understanding what our clients must do to send their products to the EU. Broadly, if the Directive requires a CE marking, then it also requires that the product has a declaration of conformity. On the other hand, if an applicable Directive requires that the manufacturer must compile a declaration of conformity, then it will also make a requirement for a CE marking. They go hand-in-hand. So, what is a declaration of conformity? A declaration of conformity is a one-page (usually) document that indicates at a minimum the name and address of the manufacturer, product information (model, description, serial number or range of serial numbers), the Directives complied with, the EN standards applied to prove conformity, and a sentence declaring sole responsibility by the manufacturer for the compliance of the product. There is no mystery or magic to the declaration of conformity. The manufacturer even has a simple list to refer to in the Directive. See the RED 2014/53/EU, Annex VI. 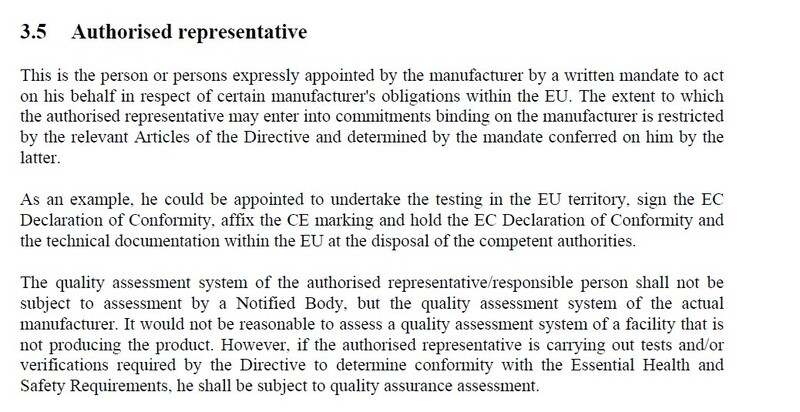 Please note that there is no place for a 3rd party lab to sign or stamp the EU declaration of conformity. There is instruction regarding indicating that a Notified Body has been involved, however, in those cases it would be unlikely that the 3rd party test lab would be the same as the Notified Body because of the inherent of conflict of interest. Indeed, involvement by a Notified Body is as much a check on the manufacturer as it is on the technical intervention of the test lab. Looking at the document, it seems simple enough and if you were making only a handful of products it would be pretty simple to draft a declaration of conformity each time you make a product or a handful of products. But, what if you make a bunch of products and in high quantities? It might be more challenging to draft and sign the documents in those cases. The simplified EU declaration of conformity can make that easier. In the RED 2014/53/EU we first see the mention of it in recital (31). It is mentioned again in Article 10 (9) and provides the instruction that it can be referred to by internet address. And, finally, we see in Annex VII it is listed on its own. This allows for a manufacturer to ease the compliance burden for a product by putting the declaration of conformity on the web, instead of printing it in a manual. Additionally, we note that you can indicate a range of serial numbers on a single declaration of conformity. That means you can indicate, using one web address, the sole declaration of conformity to prove compliance for an unlimited number of products to which the declaration of conformity applies – and you can update the document to indicate new serial numbers and even new compliance methods (for instance new testing if a standard is revised, etc.). I want to note that although I have known about the simplified declaration of conformity for two years it was not until I read a similar requirement in the new PPE Regulation (EU) 2016/425, recital (24) that I decided to point this new trend out in a blog article. 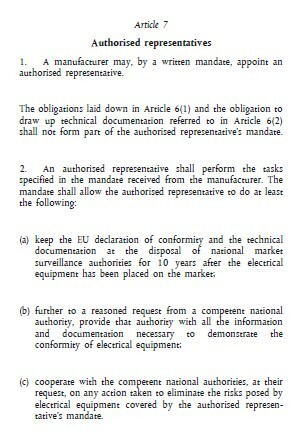 You may consider it a good idea to adopt the simplified EU declaration of conformity format, even for products that don’t require it (for instance, medical devices, or products under the Low Voltage Directive) because it could ease the overall burden of keeping the document in order: One document in one place.